Today's physicians have commands flying at them wherever they go. Click this. Don't click that, but select this pull-down menu. Code it this way, but be careful not to undercode since you can get in as much trouble as if you overcoded. Make sure you have the right modifier. It goes on and on. One might think the industry has come full circle. Some may think it's spun twice and wonder if it's going to keep spinning. Physicians just want to do what they dreamed of doing: treat patients. According to a time-motion study conducted by experts at the American Medical Association and Dartmouth-Hitchcock health care system, physicians spend just 27% of their total time on direct clinical face time with patients and more than 49% of their time on EHRs and "deskwork." The study also found that physicians spend another one to two hours each night on clerical work, most of it EHR-related. These findings were backed up by a study performed by St. Luke's University Health Network indicating that it's now routine for physicians to perform 4,000 daily clicks in the EHR. A brief review of the last 100 years of medical documentation will show that, indeed, medical documentation has come full circle. Some might argue medical documentation is on its second rotation. At the turn of the 20th century, physicians did most of their own documentation. It consisted of brief, handwritten notes. As medical research became more prevalent and the need for greater detail evolved, the medical transcription industry was created. Transcriptionists could document much quicker, with better quality at a far lower cost. Efficiencies grew with the advent of the Dictaphone in 1907. By midcentury, recorders and telephony were fueling outsourcing. Computers, digital storage, and the internet opened up offshoring to even lower price points. Offshoring further commoditized medical transcription and ignored the added benefits of having a qualified party proofing content. The introduction of the EHR coupled with government mandates to actually use the technology concluded the first circle as the work shifted back to the physician. The first circle took approximately 100 years to complete; the next is more than 15 years in the making and not quite complete. But if the health care industry has learned anything, it won't ever close the second circle. So where does the next generation of EMR/EHR technologies take medical documentation? Back to physicians doing their own typing. As with most things today, circle two is moving at a lightning pace. EHR vendors initially sold their technology based on the premise that it would eliminate medical transcription costs. While this was initially attractive, physicians quickly discovered that they spent more time doing data entry and less time seeing patients. The cost didn't actually decrease; it just shifted back to the most expensive human resource in the workflow. Physicians expressed their frustration, and EHR vendors responded with more templating and other methods to speed the documentation process. On the surface, this approach looked promising, but new initiatives such as meaningful use, recovery audit contractor audits, and ICD-10 required that data be more detailed and patient specific. Boilerplate text and copy/paste would not suffice and in many cases led to declined reimbursement, clawbacks, and fines. This forced the industry to once again seek documentation experts. However, returning to transcription per se would mean executives would have to admit they were wrong. To avoid this ignominy, instead of seeking out transcriptionists, they hired scribes. While there is still significant typing, scribes are also EHR experts, entering data in discrete fields including checkboxes and dropdowns. Scribes typically perform their tasks while shadowing the physician during patient encounters. This allows the physician to reestablish focus on the patient. Just as in circle one, the natural progression from hiring scribes is to seek less expensive options. Outsourcing scribes can deliver an immediate cost arbitrage. Also, the removal of the second person from the exam room may make patients more comfortable. The counter is that it can bring HIPAA concerns—many scribe companies use off-the-shelf technology such as Skype. While the business associate agreement can paper over this issue, verifiable accountability remains an open question. An executive from a leading health care technology company refers to this circular progression as "paving over the cowpath." The first loop didn't result in cost savings, so why would anyone think doing the same thing with different titles will result in a different outcome? The future of health care documentation remains a bit fuzzy, but one thing is for sure: Pushing cost from one cog to another doesn't reduce cost; it just shifts the cost. • automate delivery of content to the EHR to meet meaningful use, MACRA (Medicare Access and CHIP Reauthorization Act), and MIPS (Merit-Based Incentive Payment System) requirements. • It dictates a single voice file for each encounter (as opposed to typing or dictating multiple separate sections, which slows down the process significantly). • A scribe or transcriptionist edits the unified voice-recognized content. • Proper EHR integration automatically parses and completes the chart. Smart technologies such as voice recognition coupled with natural language processing exhibit the most promise for driving cost down, adding intelligence, and speeding chart completion. Voice recognition can do the initial heavy lifting. In some cases, a front-end solution works fine, but if it increases the load on the physician, it fails. 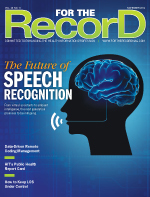 Back-end voice recognition is often the best solution to ensure physician productivity. A clinical documentation specialist with knowledge of the specific EHR edits the draft, assesses content, and flags potential issues. Once the draft content is complete, natural language processing then can be used to structure and codify the narrative content before it's delivered to the EHR. Codified content effectively turbocharges computer-assisted coding technologies that underlie many leading EHRs. This helps to make coders more productive, reduces errors, and improves alerting and reporting. It produces a workflow that puts the right resources in the right place. In the end, technology must work for those delivering medicine. Physicians are expensive resources who aren't particularly well suited for data entry. Having them spend most of their day looking at a computer screen is clearly not the best use of their time. Forward-thinking organizations will look to end health care documentation's vicious circle by deploying the right mix of human resources and technology to improve patient care and increase sustainability. Documentation solutions must focus on what matters most to physicians—having enough time to deliver quality patient care. — John Weiss is executive vice president with Scribe, a technology company that empowers health care providers to create and manage medical records.